C & C Auto Service is dedicated to making your vehicle run stronger and for longer. The key to your vehicle’s longevity is proper maintenance. Our team of ASE Certified Technicians will create a personalized factory scheduled maintenance plans that suits your car and driving habits. Your plan will include timely and efficient oil changes, tune-ups, tire service, car inspections, and more. Overall, our goal is to extend the life of your car and avoid costly repairs through proper maintenance and service. Being a great auto service shop only brushes the surface of what we can do. Brakes are one of the most important components of your vehicle. Proper brake repair and maintenance will not only improve the car’s performance but also help reduce your gas mileage and extend the life of your tires. Brakes have the potential to last a long time with proper maintenance and care. Let our Brake specialist inspect your brakes and see what we can do to help maintain and avoid costly repairs. Going the extra mile with every auto service is the way we do things around here. 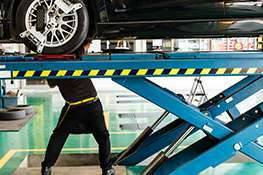 Whenever you have your car serviced with us we will perform an inspection of your vehicle to make sure there are no other immediate repairs necessary and inform you of any repairs or services you will need in the near future. We will go over everything and answer any and all of your questions prior to any repair. It’s our job to help you make the best decision’s for your car. We understand that unexpected car trouble does happen. We have financing available for unexpected auto services that may arise as well. Getting around when your car in the shop isn’t easy. That is why we offer free local shuttle service to get you home or to work. Furthermore, we have loaner cars available upon request. For routine maintenance and repair appointments, we have a comfortable waiting area with complimentary Wi-Fi, water, and coffee while you wait. We place a high premium on customer service and will go above and beyond to make sure our customers get what they need at a fain and honest price. Why Choose C & C Auto Service? We could list a million reasons why you should choose us but we think review sites will do us more justice and give you a better feel for how we do business. Check out the following review sites and we promise you wont be able to find a reason to not come to us for your vehicles repair service and maintenance. Call Today or schedule your appointment online. Our team is ready to help you with any and all auto service and maintenance.